Academicians at a seminar in Rangpur have suggested the newly appointed university teachers to be sincere in teaching students to make them worthy citizens of the country. 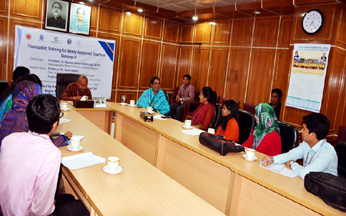 "The new teachers should have ideas about teaching, administrative and examination related affairs and other subjects to perform duties in a disciplined manner," said Vice-chancellor (VC) of Begum Rokeya University, Rangpur (BRUR) Professor Dr Nazmul Ahsan Kalimullah. He said this last night while addressing the seminar on 'Foundation Training for Newly Appointed Teachers' organised by Institutional Quality Assurance Cell (IQAC) of the university at the conference room of the academic building on the campus. Director of IQAC at BRUR Professor Dr Nazmul Haque presided over and moderated the seminar participated by the newly appointed teachers of different departments of the university, reports BSS. Professor of the Department of Development Studies of Islamic University, Kusthia, Dr Nasim Banu conducted the seminar as resource person. Prof Banu in her presentation laid maximum emphasis on the timeliness, success, innovative ability and human values and rich personality of the teachers in the teaching profession. "Such type of seminars and discussions will help the newly appointed university teachers to have a positive impact on their professional career to teach their students properly," she hoped. The chief guest suggested the new teachers to acquire ideas for ensuring quality in higher education to develop educated citizens for the competitive 21st century in turning Bangladesh into a developed country. "The newly appointed university teachers should put utmost importance on academic responsibilities, curriculum concept, research activities and publications and other related aspects to ensure quality in higher education," he added.